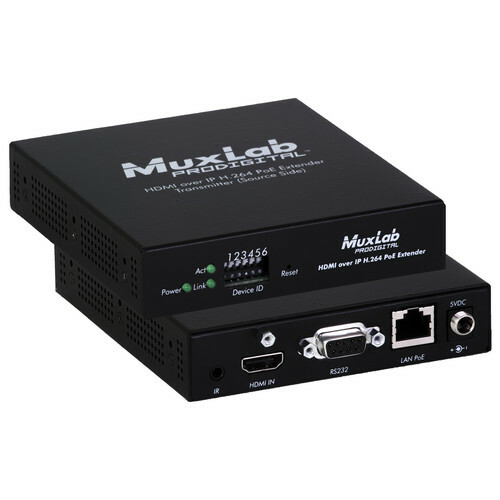 Muxlab 500757-TX är en sändare för att skicka HDMI med H.264 över ett nätverk. Sändaren är designat att arbeta med en PoE ethernet switch. Om man inte har en PoE switch så krävs det separata strömförsörjare (500993). The HDMI over IP H.264 PoE Extender Kit allows HDMI source and display equipment to be connected in point-to-point, point-to-multipoint and multipoint-to-multipoint configurations via a local Ethernet network, in a flexible, expandable and cost effective manner, without the need to install dedicated cabling systems. Connectivity may be up to 330ft (100m) @ 1080p via Cat5e/6 UTP cable, and the device supports PoE (PD) if used with a PoE (PSE) Ethernet Switch.